The living room has been a location staple for plays forever. With a familiar locale to set up a play, drawing upon a new idea may be difficult. 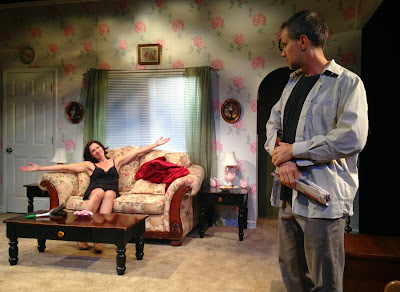 In William Goulet’s Filler, all the action occurs in the living room of a disconnected husband and wife as they reattempt to get intimate just as a stranger arrives offering to fix the columns or pillars that are crumbling on their stoop. Filler follows married couple Marian and Adler as Marian plays mind games on the sheepish Adler in order for the pair to feel intimate again. While engaging in a little roleplay, a stranger, who happens to be a contractor, arrives at the house and finds himself hired to fix the mess on their stoop. The next day Kyle the contractor and his simple buddy Benny begin their work as more mind games ensue. Filler is a confused comedy. It begins as a series of comedic vignettes with two outrageously different characters in almost a farcical manner. As more characters arrive and more realistic situations are addressed, the farce begins to dwindle into a different style of comedy until Act II becomes an entirely different play losing nearly all of the comedy and takes a turn for the dark side. Goulet’s script, though seemingly simple, has so much going on that many ideas that are established in the beginning and either never get addressed again or find a very loose resolution. Act I is filled with secret upon secret with lack of exposition that makes the choices on stage bizarre and unclear. When we’re instantly bombarded with some answers in Act II, it becomes clear that we’ve entered an entirely new style of theater. It’s almost as if Goulet couldn’t decided whether he wanted to write a living room comedy or a living room drama. Goulet, who also served as director, seemed to know the journey of this play and the characters themselves better than his company, and unfortunately wasn't able to convey them. This was largely due to some script decisions that contradicted the characters themselves. The overlying theme of the play is truth. From start to finish, discovering who was telling the truth was a central and strong idea. Unfortunately for Goulet, his bold source that ties the truth theme together, the chicken article, does not read as well as he thinks it does mostly because it is not addressed in a strong enough manner. If this article was as important as it’s supposed to be, it needed to be punched up even further. With an unclear idea of what style this play was, there were an abundance of acting styles on stage. Gabriele Schafer and Ross Pivec as Marian and Adler respectively seemed to live in a heightened comedic world that served them well in Act I but then drastically needed to change to suit Goulet’s different Act II. Kyle Minshew as Kyle was successful in both Act I and Act II perhaps because his character was always the “straight man” in this world. Adam Hyland as Benny had perhaps the most difficult backstory and arc to tackle. His final moments on stage as a strong-willed and coherent individual were radically different than the entire rest of the play where he was meek and clueless. It was a bit jarring and seemed to confuse his entire arc. With Goulet as playwright and director, his guidance of the characters was lacking again due to their unclear journeys. However his staging was quite good. With an intentionally small box to play in, it played well into the lack of escape for these characters. The set designed by Christopher and Justin Swader was quite stunning in a simplistic way. The boxed in feel of the living room with the partial walls was a strong artistic choice. The asymmetrical symmetry gave the world a nice touch but the reality of some of the furniture pieces on the outskirts of the box were a bit forced. The lighting by Mary Ellen Stebbins added a nice touch to the world, especially during the scenes in the evening. Filler is a jumbled mess of a play with too much happening in too short of a time. Perhaps more work or an outside artistic eye was needed before bringing Filler back to life.